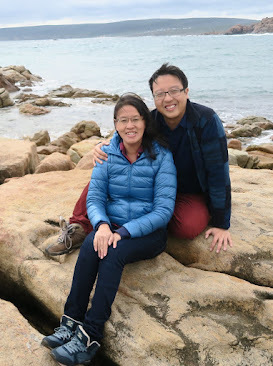 It was a rather sad departure for us as we had grown fond of our hosts Mr and Mrs Park, as well as the lovely Bellus Rose Pension, not to mention the charming and quaint city of Gyeongju. Mrs Park was particularly kind and offered to drive us to the KTX train station for a small fee. As we did not want to endure the one-and-a-half hour bus journey with two small kids, we took up her offer gratefully. 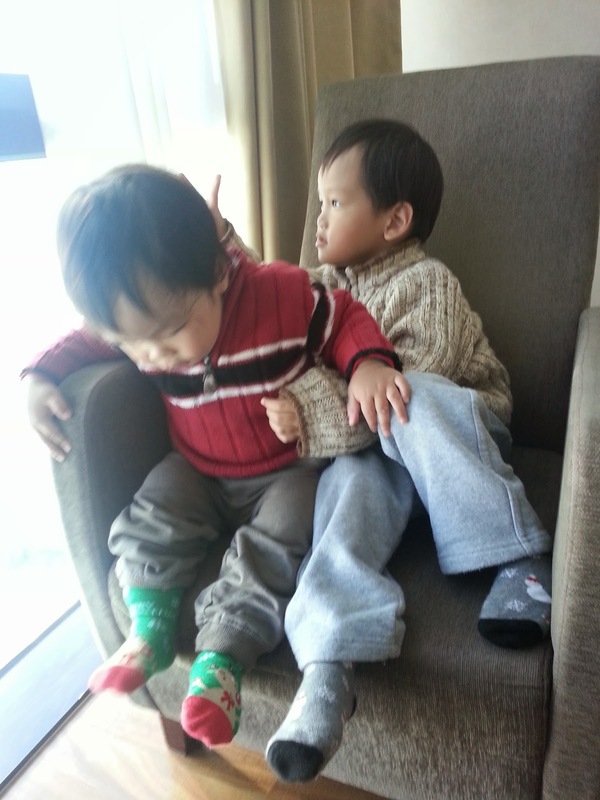 The return train to Busan was thankfully uneventful, and our younger son E slept through the journey, allowing us to tend to our older child Z, who spent most of his time looking out of the window and enjoying the scenery. Upon arrival in Busan, we transferred to a taxi and was swiftly transported to our final hotel for the trip, the Sunset Business Hotel. Our decision to stay at this hotel was not without its reasons; the previous hotel had the peculiar distinctive of installing a rubbish chute in the shower area and we were just not prepared to stay another night there. Thankfully our new abode was more than what we had imagined and the kids quickly settled in comfortably. All's not complete without a quick rolling on the "bouncy bed". And the best part yet - a lovely view of the Haeundae Beach! 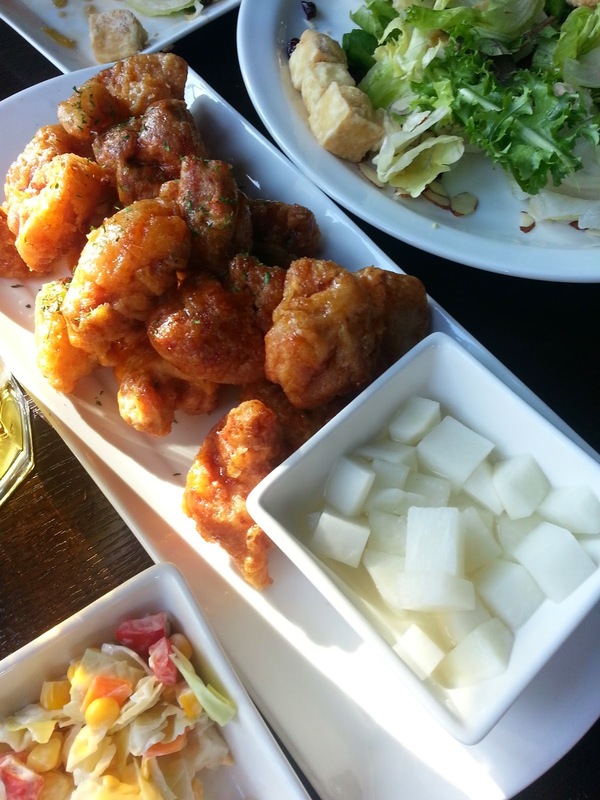 Bonchon Chicken - the Best in Busan! The rumbling in our tummies reminded us that we had not eaten lunch. So we decided to go for a relaxing lunch before taking as stroll around the Haeundae Beach area where our hotel was based. Randomly deciding on a restaurant opposite our hotel, we were surprised by how good the food was! the ala carte menu looked more interesting. fried chicken. It's quite a lovely combination! as the skin is melted away during the frying process! After a delightful lunch, it was time to get our leg muscles moving. Dongbaekseom Island, so named because of its abundant dongbaek (or camellia) trees, was conveniently located nearby, and we enjoyed a lovely afternoon walk there. While Dongbaekseom is not actually an island now due to the natural accumulation of sand over the years, an outing there still provides the impression that you are in another world. The littler one sucking it all in. Lovely view of Haeundae Beach. Beautiful sunset by the APEC House. As the sun set, the weather began to get very cold, and we hurriedly returned to our hotel, where we settled for a simple dinner and an early night. Next: Remembering the Korean War at the UN Memorial Cemetery and getting a bird's eye view from the Busan Tower. Previously: Exploring the grand Bukgulsa Temple in Gyeonju and a venture into the Korean indoor playground scene.